Still here. Still pregnant. 39 weeks and 3 days. I'm due on Friday and if she's not born by the 29th I'll be induced - that's next Sunday people! 7 days! Or less than! Can I get an amen?! I'm sooooo excited to meet Jane and see her sweet face and dress her in cute clothes. I hope she has lots of hair. So here I am, about ready to pop! 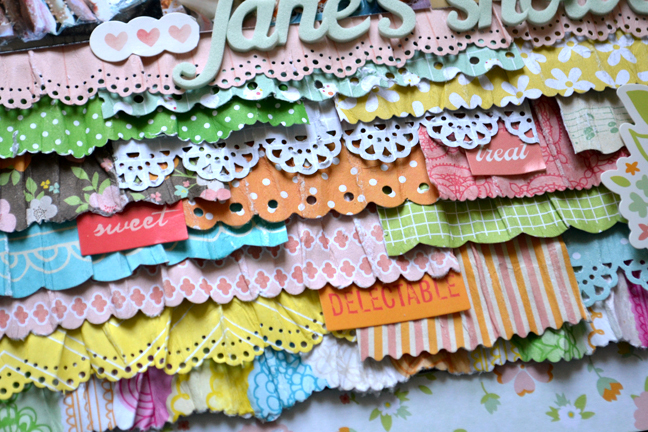 How to: Cut strips of patterned paper and trim or punch one edge of each strip with decorative scissors or a border punch. Spray each paper strip with water, crinkle, and let them dry. Stagger the paper strips across a cardstock block then place it below photos on a floral paper layout background. Make a title, write journaling on the edges, and embellish with stickers and a tag. Now I'ma play with my son and give him lots of attention until the Bachelorette finale - go Jef!! YAY!!! Can't wait to see her!! I love love love your lo!! LOVING the colors and loveeeeeeeeeee those amazing layers of paper!!!! Gorgeous!! Final countdown. How exciting! You still look so tiny to me! Love that you snuck in some scrapping... A girl after my own heart. Thanks, Jane, for not stealing my July 21 thunder, so please come soon now! You look SO cute! Love that page too! You look GORGEOUS!!! I'm so excited for you! I hope she comes the very second that your mom gets there. YAY!! It's almost Jane day! SO excited for you, Chris & Fox! You are ADORABLE. I wish you a speedy, wonderful delivery! Loved your layout, love the layers! What a great LO!!!!! I'm loving the sweet pics and also the AMAZING texture - wonderful!! Such a cute belly shot of you too!! Enjoy every last day of your family of 3. Praying for a safe and healthy delivery of baby Jane! It's coming!!!! I can't wait for you to see her sweet face either, I am so excited for you! Now about that LO...Can I just say I'm drooling over here over that layered goodness! You never fail to amaze! oh my goodness, your belly is ready to pop, your smile shows you are so excited, and your page is just gorgeous!! Haha I love that you're still scrapbooking when you're about to pop. Your baby belly is so cute! Come on baby jane lets hurry up!! yay!!! baby jane is almost here! so pumped!! Love the layout, so very cute, but I can't wait to see your layouts of sweet baby Jane!! You look so pretty pregnant!! Yeah! Can't wait to see what she looks like--SO fun! you are adorable, she is going to adorable and this layout is delicious! Love it!